By Viotti, Giovanni Bat (Fritz Kreisler) - Viottis Concerto No. 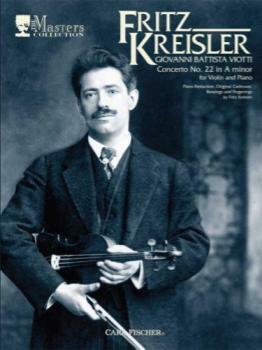 22 in A minor was a great performance favorite of violin pedagogue Fritz Kreisler, both with orchestra and piano reduction. This new edition contains Kreislers original piano reduction and cadenzas, which serve not only as accompaniment but enhance the piece by adding new melodic lines and counterpoint. Along with his bowings and fingerings, Kreislers edition of the Concerto No. 22 will restore it to its rightful place as a true masterpiece for violin performance. For advanced players.